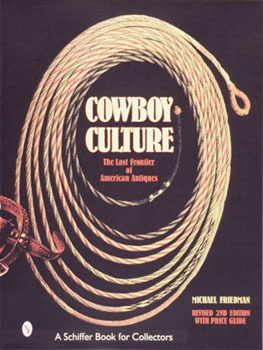 The American cowboy's unique life-style inspired tools, clothing, amusements, advertising, and more which are avidly sought by collectors today. They are presented here with over 1000 color photographs identified in text and captions. Each section of this beautiful new second edition is more complete and has better examples than earlier books devoted to each subject.In Cowboy Culture, these items are inspected in their many variations. Here are exquisite spurs, saddles, gambling tools, photography, guns, holsters, bits, chaps, gloves, boots, hats, badges, and knives. Objects related to Wild West shows-which popularized the myths and accomplishments of cowboys to town dwellers who fantasized life on the open range-are also included. That same fantasy endures to this day as people all over the world who today dream of being a "cowboy."